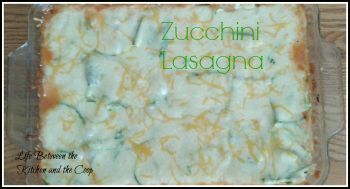 My Zucchini Lasagna recipe is a great answer to all of the zucchini from your garden! Like I mentioned in an earlier post, we have a garden. It is giving us a crazy amount of produce and we are loving it! Next year we wants to double or triple the size of the garden because we are enjoying doing it so much. Anyway, we have gotten lots of zucchini from the garden. I know a lot of people end up giving away a lot of zucchini because they just don’t know what to do with it all, but I have made it my mission to find uses for the zucchini. Of course, if you eat zucchini the same way all of the time you will get sick of it, so we don’t! This is one of my zucchini experiments that turned out amazingly! 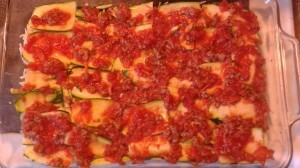 Check out my zucchini lasagna! I should preface my ingredients list by saying I make my own marinara. I usually make my marinara with 1/2-1 pound of browned ground beef in it because I like meat in it, but you could totally do it without meat if you want. Next do a single layer of sliced zucchini, covering the sauce completely. Next make a layer of the browned and drained ground beef, then a layer of pepperoni (I usually only do one layer of pepperoni in the whole lasagna, but you could do more than that if you like). 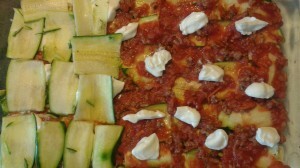 After that do a layer of cheese, another layer of zucchini slices, and then another thin layer of sauce. On top of the sauce, sparsely place 1/2-1 tsp blobs of plain greek yogurt (you could use ricotta cheese if you don’t care for greek yogurt). You can see in the picture below how I placed the yogurt. Now, just keep alternating layers of all of the ingredients until the pan is just about full (I only did one layer of greek yogurt in the whole dish. I don’t recommend doing more…keeps the flavor of the yogurt subtle, so it doesn’t overpower the lasagna). Once your dish is pretty close to full, the top layers should be zucchini slices and mozzarella cheese. Finally, on top of the mozzarella you can put a thin layer of grated fresh parmesan cheese. I like to sprinkle a pinch of garlic salt across the top of the whole lasagna. Bake at 350 degrees for 15-20 minutes and it is done! YUM!!! 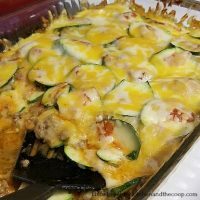 Trust me…you will LOVE this zucchini lasagna recipe! Enjoy! I know a lot of people end up giving away a lot of zucchini because they just don’t know what to do with it all, but I have made it my mission to find uses for this zucchini. Of course if you eat zucchini the same way all of the time you will get sick of it, so we are always experimenting with zucchini recipes! This is one of my zucchini experiments that turned out amazingly! I present…my Zucchini Lasagna! Now do a layer of the browned and drained ground beef, then a layer of pepperoni, then mozzarella, another layer of zucchini slices, and then another layer of sauce. On top of the sauce, sparsely place 1/2-1 tsp blobs of plain greek yogurt (you could use ricotta cheese if you don't care for greek yogurt). You can see in the picture below how I placed the yogurt. Next, just alternate layers of zucchini, mozzarella cheese, and marinara until the pan is just about full (I only did one layer of greek yogurt in the whole dish. I don't recommend doing more...keeps the flavor of the yogurt subtle, so it doesn't overpower the lasagna). Once your dish is pretty close to full, the top layer should be mozzarella cheese. On top of the mozzarella you can do a thin layer of either grated parmesan or finely shredded cheddar. Finally, get a small pinch of garlic salt and lightly sprinkle it across the top of the whole lasagna. Bake at 350 degrees for 15-20 minutes and it is done! P.S. 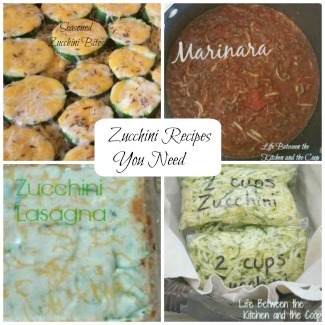 For other great zucchini recipes, check out my post Zucchini Recipes You Need! Yum! I love lasagna, and we usually add spinach to ours. But zucchini is a great idea, too! We will have to try it that way next time we make it! 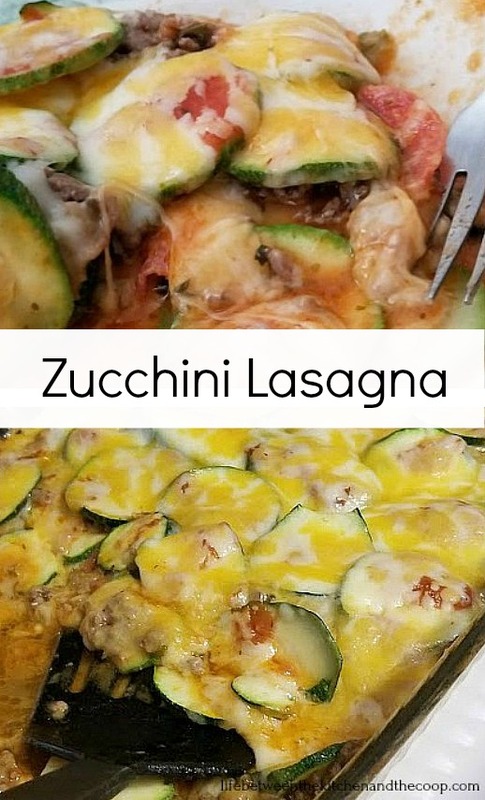 This looks like a really easy and healthy lasagna. Might just try it this weekend! So yummy, Caroline! Hope you like it! That's awesome you were able to use fresh zucchini from your garden . I can never get squash or zucchini to grow . Your lasagna looks delicious! We had so much zucchini, Kim...We STILL have several more on the counter that I need to grate and throw in the freezer! Each year my husband and I join a CSA. We get a big box of locally grown produce for 8 weeks in the summer- it is truly fantastic. The first year we got so much yellow squash and zucchini I had to go on the hunt for creative ways to use it all! I have made zucchini lasagna several times and it is so yummy. Not only does it cut down on the carb intake of the meal but also delivers kind of an undercover veggie serving- love it. Yummy! It is amazing, isn't it it? I love zucchini in so many ways! Thanks for stopping by, Coralie! YUM. I think I'll make this for dinner! this looks yummy! I used to have a small garden. Can't wait to start planting again. this looks delicious!! I love zucchini. Do you think you could freeze this? Hmmm...maybe. When zucchini defrosts it sheds some water, so if you try freezing it be sure to go very light on sauce so it's not too liquidy. I would probably try making a smaller size lasagna, like maybe cut the recipe in half or in quarters. That way if it ends up being too watery you're not wasting too much food. If it was me I would just make the sauce and brown the meat ahead of time. If you do that then you can throw the lasagna together very quickly. That way you don't risk it being too wet Add watered-down tasting.